First, the process will lead you to look for and adopt better business practices, as Ray Pagano did. The companies cultivate exceptionally intimate relationships with customers and suppliers, based on personal contact, 1:1 interaction, and mutual commitment to delivering on promises. The companies have unusually intimate workplaces. The leaders bring passion to whatever the company does. What is the essence of “mojo”? The leaders are very clear about what life has to offer at its best–exciting challenges, camaraderie, compassion, hope, intimacy, community, a sense of purpose, feelings of accomplishment–and they have organized their businesses so that they and the people they work with can get it. When outsiders come into contact with such a business, they can’t help but feel the attraction. The company is cool because what’s going on inside is good, fun, interesting, something you want to be associated with. Every founder and leader have a passion for what their companies do. They love it and have a burning desire to share it with other people. They thrive on the joy of contributing something great and unique to the world. 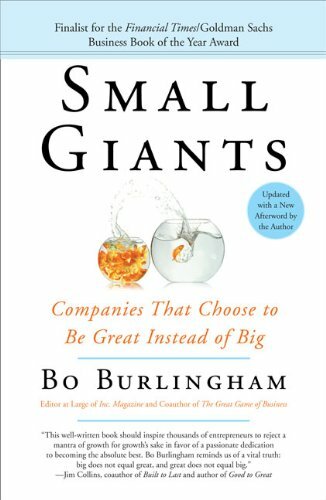 Small giants focus on the relationships that the company has with its various constituencies–employees, customers, community, and suppliers. The relationships are rewarding in and of themselves, but their strength also reveals the degree to which people are inspired by the company, and its ability to inspire them is the best measure of how they perceive the value of what the company does. businesses. They had new lives that they were fully engaged in and excited about. For some people, there was a fifth element: 5) The companies they’d created were going on without them and doing better than ever, and they could take pride in the way they’d handled one of the most difficult tasks faced by any CEO: succession.